Villa Tantawan is a one-bedroom vacation residence where you can, probably, spend your most unforgettable Thai stay ever. Not only because the villa offers luxurious appointments with unmistakable Thai elegance. 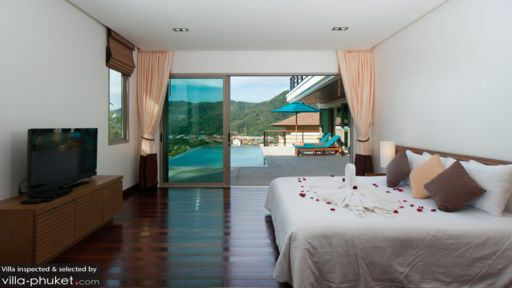 Or because the villa provides the most modern amenities seamlessly laid out in a distinctively Thai tropical setting. 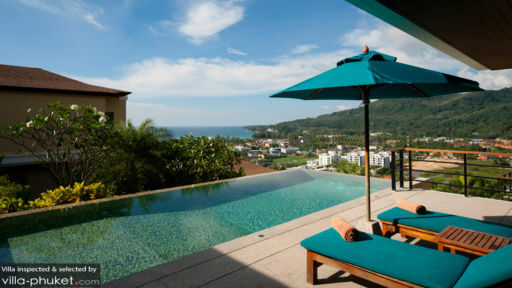 But also because of the villa’s enviable hillside vantage point which gives you an awesome view of the Andaman Sea and the verdant mountains inland. At Villa Tantawan, you and your special someone will truly experience an intimate holiday that is both blissful and heavenly. The villa has only one bedroom. It’s fully furnished with a king-sized bed, a cozy couch and a widescreen TV. It also has its very own dedicated bathroom. The bedroom opens out to the infinity pool. Outdoors – perpendicular to the villa – is the infinity pool that looks out to the coast. Jump in for a soothing dip. Or just wade aimlessly, splash around or simply linger – spellbound – by the pool’s edge and take in the breathtaking view. Cool off as you, perhaps, meditate under the shade of the sala at one end of the pool. Or stretch out on one of the pool beds partially covered by a large pool umbrella at the villa’s terrace. From the pool terrace through sliding glass doors is a compact indoor space. Settle comfortably on the cozy couch of the living area as you catch your favorite show on the widescreen TV. Right next to the couch is the round table of the dining area. Here, you can satisfy cravings with delicious and delightful dishes you yourself lovingly concocted at the kitchen section just beside the dining table. Regularly on duty at the villa is a housekeeper, a pool attendant, a gardener as well as security personnel. Villa Tantawan is nestled on the hills of quiet and more relaxed Kamala Beach – one of the most beautiful spots in Phuket with its very own bay and a fishing village amidst lush forests. The best part of the beach is along a walkway lined with nice, cozy, little places that serve lunch meals, sunset cocktails, and Thai or seafood dinners right on the sand. The main attraction of Kamala’s nightlife is an amazing circus show at the Phuket Fantasea Park. Another must-see is the all-day fresh market with fruits and vegetables like you’ve never seen before as well as snacks you will fondly remember.